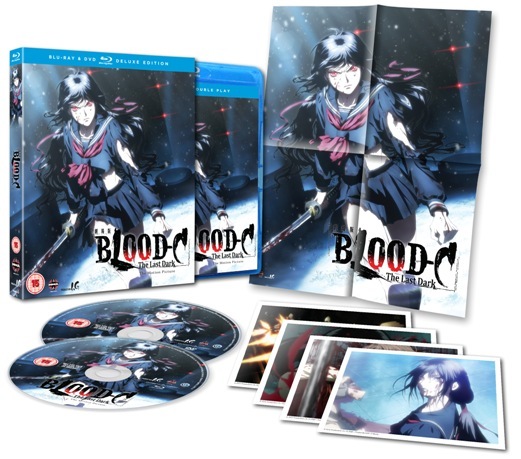 Competition: WIN one of Manga UK's Blood C: The Last Dark HMV Exclusive Collectors Editions! Competition time folks! There aren’t many great anime franchises left, and there certainly aren’t as many new entries in the existing ones. Which is exactly why fans of teeth-sharpening, blood-letting action-horror should rejoice, as there’s a new feature entry in the Blood saga coming to the U.K.! Blood C: The Last Dark picks up where TV series Blood C left off, and provides everything fans of the franchise expect, while being accesible to anyone who hasn’t seen any of the franchise previously. The Blu-ray and DVD are both on sale from Monday 24th March, but Manga Entertainment UK have kindly provided us with four copies of their Blu-ray & DVD Combo Collectors Edition, EXCLUSIVE TO HMV, to give away to you lucky people! 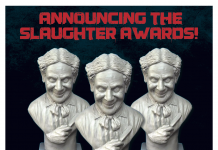 All you have to do is send us your name, age and postal address via email to competitions@thedarksidemagazine.com, and you could be in with a chance to win one. The competition closes midnight Sunday 23rd March and winners will be announced here on the blog the next day, Monday 24th March. Terms & conditions apply – see below. – and otherwise compliant with all the Official Rules. Boomstick Media Ltd. may require you to provide proof that you are eligible and the authorised account holder of the email addresses used to enter a Competition. “Authorised account holder” means the natural person to whom the email address in question has been assigned by an Internet service provider, online service provider, or other organisation (e.g. business, educational institution, etc.) responsible for assigning email addresses for the domain associated with the email address. – If you fail to provide all required information you may be disqualified. – It is a condition of entry that all information given is true, current and full. – You may not enter using multiple email addresses or as multiple participants. – You are allowed only one entry, per entrant, per competition. – If you attempt to use multiple addresses or enter more than once, you may be disqualified from this Competition. – Boomstick Media Ltd. undertakes to use reasonable efforts to maintain adequate email, internet and other communication links but is not otherwise responsible for and shall not be liable for: late, lost, delayed, damaged, misdirected, incomplete, illegible, or unintelligible entries; telephone, electronic, hardware, or software program, network, Internet, or computer malfunctions, failures, delays or difficulties; errors in transmission; or prize deliveries attempted but not received. 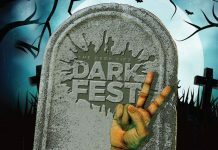 – If you are disqualified, Boomstick Media Ltd. is under no obligation to publish this fact on The Dark Side Magazine website or anywhere else. – Boomstick Media Ltd. reserves the right to substitute any prize with a prize of equal or greater value or a cash alternative at any time and for any reason, e.g. if the advertised prize is no longer available. – The prize winner for this Competition will be chosen randomly from all valid entries received. – The Prize will be delivered to the email address or home address of the prize winner. Please allow twenty-eight (28) days for delivery. – Return of any prize or prize notification as “undeliverable” will result in disqualification and an alternate winner may be selected. Entry: By entering this Competition, entrants agree to accept and be bound by all terms of these Official Rules and by all decisions of Boomstick Media Ltd.